People whose work constantly requires overhead reaching -cabin crews and many other manual laborers for example- may develop pain and discomfort in their shoulders. Athletes or even non-athletes whose hobbies require them to do the same- swimmers or even baseball players to name a few- may also develop this condition. Athletes, cabin crews, and those who rely on repetitive overhead raises to do their job, are prone to developing this condition. It may also be a direct result of injury or trauma to the shoulders. Additionally, it may develop without any apparent reason. This condition is also linked to age. The older the person, the higher the chance of developing this condition. Lifestyle also plays a big role, as most people who develop this condition are habitual smokers. 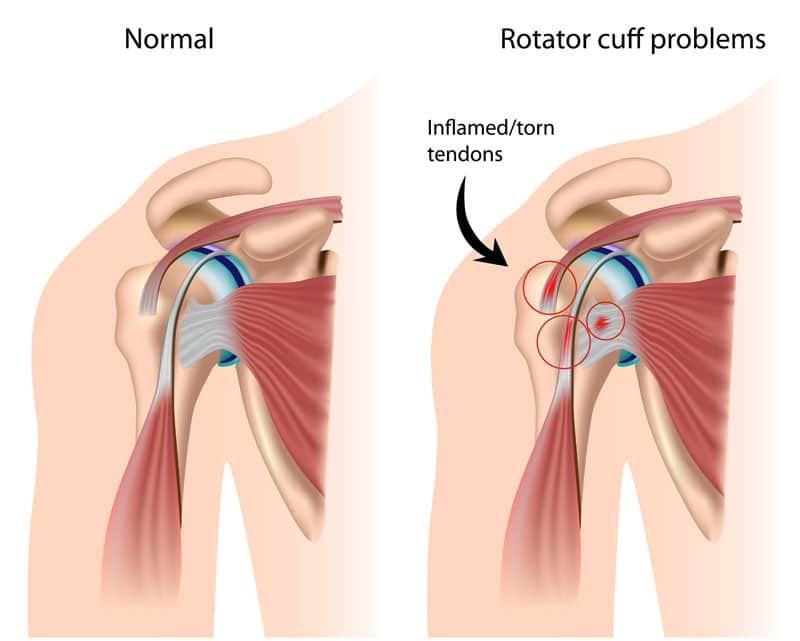 Tendinitis – meaning inflammation of the tendon – with its “great responsibility” it is more prone to get irritated and then may cause inflammation. Bursitis – meaning inflammation of the bursa – the lubricating sac found in between the bones and the rotator cuff. Irritation and inflammation can occur in this area as well. Impingement – as you do overhead raises, the rotator cuff is pushed upward towards the bones. When done repeatedly, inflammation can occur in the tendon and/or bursa. Calcific – as a result of the body trying to heal, calcium deposits may accumulate in the injured part of the tendon. Rest – avoid or limit overhead activities. Anti-inflammatories – to lessen the inflammation. Physiotherapy – for restoration of normal motion, stretching, and strengthening. Steroid injections – if conservative management is not enough to manage your symptoms, this can be an option. Ultrasound-guided needling and aspiration– applicable for the calcific tendinopathy. Your specialist can do this procedure using only local anesthesia. You then will be evaluated with x-rays to determine your progress following the procedure. management could be done to alleviate the symptoms, surgery can be done. Keep the muscles in your shoulders flexible and strong. Daily exercises to maintain strength and flexibility may be the best defence against rotator cuff disorders. Have good posture at all times. Stand straight and relaxed, without slumping. To strengthen your rotator cuff, it's best to use lower resistance with more repetitions. Low resistance exercises gradually strengthen these small muscles without the risk of injury.